Our Full Lineup and info for our Cuatro de Mayo show will be posted her shortly; please check back. 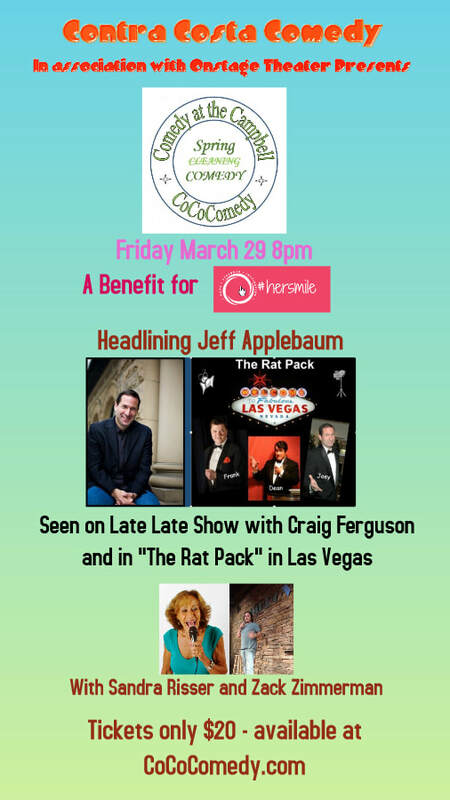 We've got a great show for you this Friday March 29th benefiting hersmile.org and featuring some of the best comics in the Bay. We provide mini-financial grants to families who have experienced the tragic loss of a dependent child or the loss of a parent with dependent children. In addition, we fund programs in Pre-K through 12th grade that teach Social and Emotional Learning skills in order to best face life's great challenges. Your Headliner for the evening is Jeff Applebaum. Born and raised in Colorado, Zack Zimmerman (Comedy Works Denver, Denver Improv, Tommy T’s in Pleasanton, CA, Laughs Unlimited in Sacramento) takes the Mile High road every chance he gets. Zack draws on real life situations and stories for inspiration, occasionally adding a musical element. His perspectives on life are completely unique, making him truly one of a kind. Visit MainStreetMartinez for a list of restaurants for dinner before or after the shows. Check with the restaurant for hours and reservations. Vinnies third Thursday Comedy Showcases. Free Comedy Showcase featuring some of the best Bay Area comedians. Hosted by Mean Dave and produced by Kathy McCarty. See dates for upcoming shows on the flyer to the left. Free Comedy Showcase at Bar Cava in Downtown Martinez. Featuring some of the best Bay Area comedians. This show runs twice/month and the next shows are April 23rd and May 7th. Shows start at 7:00. In this monthly stand-up comedy series, seasoned comic Liz Grant brings a host of Bay Area and Los Angeles comedians to the Village Theatre stage in Danville. With a fresh set of headliners and featured comics for each show, every performance will be a wild and wacky night of laughs. So far, our first 6 shows have raised over $10000 dollars for local charities. Our first show in 2016 raised over $2000 dollars for The Boys and Girls Club of Contra Costa, over $400 from a special promotion for the Hemophilia Foundation of Northern California, and $300 for the German Shepherd Rescue of Northern California. Our 2017 shows raised $2300 for the Boys and Girls Club of Contra Costa, $2500 for Volunteers of America and over $200 from a special promotion for the Hemophilia Foundation of Northern California, and $300 for the German Shepherd Rescue of Northern California. Shows in 2018 have raised over $2100 through May. Produce Quality, Independent Comedy shows within the Contra Costa Area while supporting local charities, and promoting other local comedy shows, showcases, and open mics. Bob Johnston has been performing stand-up comedy around California and the Pacific Northwest for the last 21 years. He and his wife Vidah moved to Martinez in 2009. When he learned that Martinez had an outdoor amphitheater, the idea for Comedy Under the Stars was hatched as a way allow the community to use the amphitheater while raising money for local charities.